Enid’s is at 560 Manhattan Avenue on the corner of Driggs Avenue. At $12 this negroni’s pretty expensive, but, as the bartender told us ‘it’s basically pure booze’ and boy does it pack a punch (in a wonderful, ice-cold way). 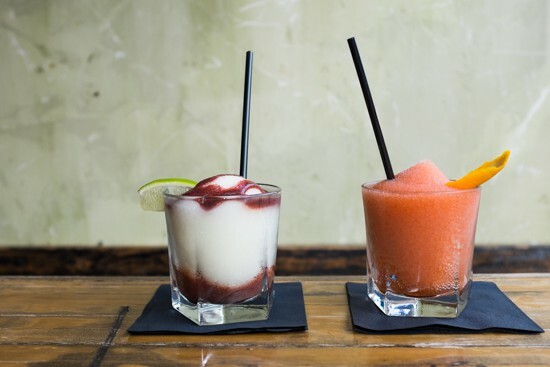 If Campari’s not your thing, they also do a frozen strawberry margarita ($8) which our arts editor described as ‘unbelievably exquisite’. 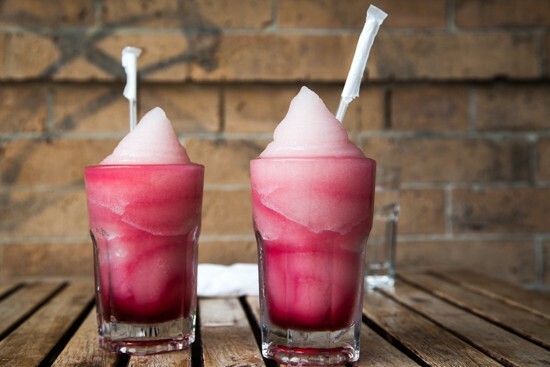 The secret is in the strawberry syrup which is infused with mint and makes for a really delicate, beautiful frozen beverage. Lake Street is at 706 Manhattan Avenue between Norman and Meserole Avenues. 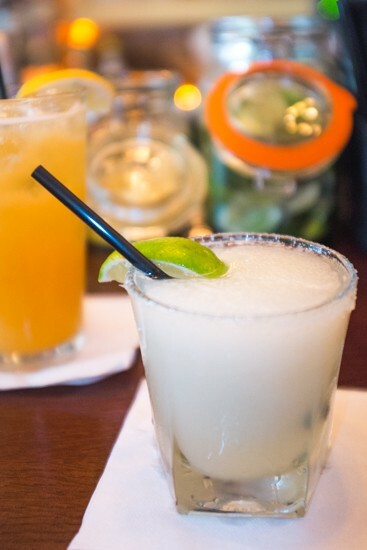 Calexico’s margaritas always get me drunk, and this one’s no different…it’s just delightfully icy. These come in at $9 a pop, and are best sopped up with a baja fish taco or two. And if you’ve seen the lines for the Calexico cart by Madison Square Park recently, you’ll be grateful for the comparatively speedy service here in Greenpoint. Calexico is at 645 Manhattan Avenue, between Nassau and Norman Avenues. Miniature paper parasols in drinks have always given me a tiny thrill, and when accompanied by an exotic green leaf they’re even better. 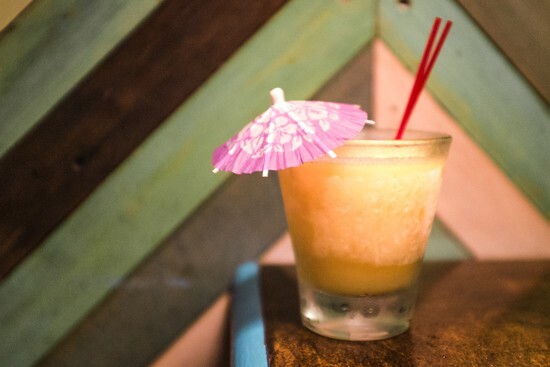 This tropical tiki extravaganza instantly transports you to vacation mode and, although it costs $12, it’s a long drink and is one to be lingered over. We liked ours so much we shifted into the shaded backyard for a second round. Broken Land is at 105 Franklin Street between Greenpoint Avenue and Milton Street. This was my least favorite of the five slushies we tried, but the environment is fun and summery so I’ve included it anyway. 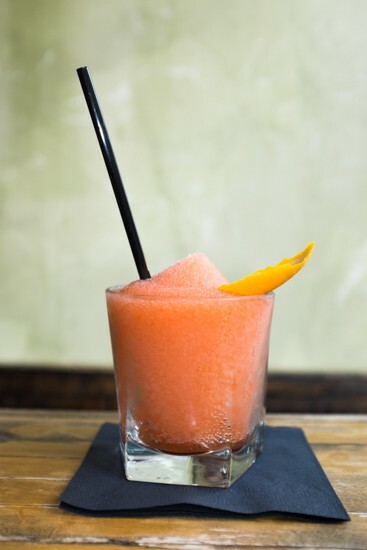 The Bitter Betty is a frozen grapefruit margarita. It’s nice, but it’s not very strong and at $12 for a small glass I was left wanting more but unwilling to fork out for another round. The surroundings are colorful and jubilant though, and the half inside/half outside arrangement of the bar evokes the feel of a tiki surf shack which is useful when trying to forget one’s immediate proximity to the BQE. 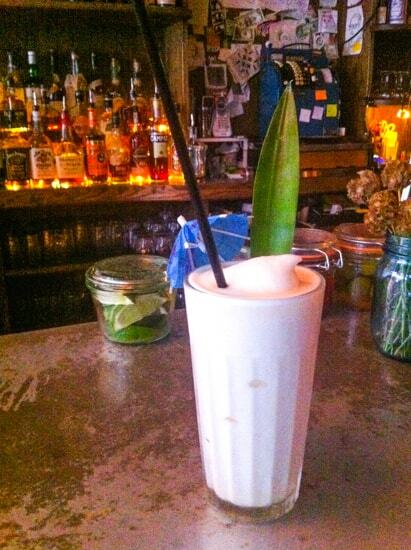 They also do a Dark and Stormy ‘Frozie’ at $11, so perhaps this one is worth going back for. Battery Harris is at 64 Frost Street, by the Meeker Avenue intersection.